The scene of the action between the Queen's Rangers and the Stockbridges was Van Cortlandt Manor, a large estate situated between Broadway and the Bronx River. Midway between the manor house and the river was Mile Square Road, connecting the Albany Post Road (Broadway) with the small hamlet of Mile Square in Westchester County. 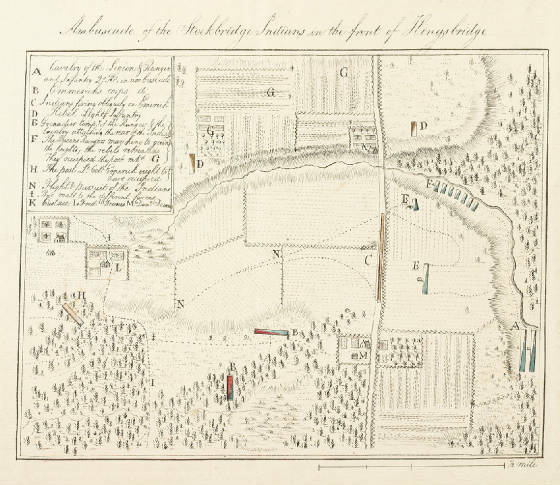 Almost all of the ground on which the battle between the Stockbridges and Queen's Rangers was fought is now preserved within Van Cortlandt Park. The lane described in Simcoe's account is still there, linking the old Mile Square road with a residential neighborhood just north of the park. The fields and forests of the battle are now covered by some playing fields, but mostly with luxuriant forest. On August 31st, Simcoe implemented his planned revenge. Moving forward from the Kingsbridge section of the Bronx in the early morning with five hundred men from several units, Simcoe hoped to entice the Americans forward down Mile Square Road from their positions. At the same time, he would divide his own forces in an effort to envelop and trap the Americans. Emmerick's Corps was to take up a position westerly of Tibbet's Brook and Mile Square Road near the residence of a Frederick De Voe, while the Queen's Rangers moved up along the Bronx River; both units were hidden from the Americans by the natural fall of the land. [Emmerick] most unfortunately mistook the nearer house - Daniel DeVoe's - for one at a greater distance, the names being the same, and there posted himself, and sent from thence a patrole forward upon the road, before Lieut.-Col. Simcoe could have time to stop it. This patrole had no bad effect, not meeting with an enemy; had a single man of it deserted, or been taken, the whole attempt probably had been abortive. Lieut.-Col. Simcoe, who was halfway up a tree, on the top of which was a drummer boy, saw a flanking party of the enemy approach. The troops had scarcely fallen into their ranks when a smart firing was heard from the Indians, who had lined the fences of the [Mile Square] road, and were exchanging shot with Lieut.-Col. Emmerick, whom they had discovered. The Queen's Rangers moved rapidly to gain the heights, and Lieut.-Col. Tarleton immediately advanced with the Hussars and the Legion cavalry; not being able to pass the [stone] fences in his front, he made a circuit to return upon their right, which being reported to Lieut.-Col. Simcoe, he broke from the column of the Rangers, with the Grenadier Company, and directed Major Ross to conduct the Corps to the heights, advanced to the road, and arrived without being perceived within ten yards of the Indians, who had been intent upon the attack of Emmerick's Corps and the Legion. The Indians now gave a yell, and fired upon the Grenadier Company, wounding four of them and Lieut.-Col Simcoe. They were driven from the fences, and Lieut.Col. Tarleton with the Cavalry got among them and pursued them rapidly down Cortlandt's ridge; that active officer had a narrow escape; in striking at one of the fugitives he lost his balance and fell from his horse. Luckily the Indian had no bayonet and his musket had been discharged. The Indians fought most gallantly; they pulled more than one of the Cavalry from their horses. French, an active youth, bugle-hoary to the Huzzars, struck at an Indian, but missed his blow; the man dragged him from his horse, and was searching for his knife to stab him, when loosening French's hand he luckily drew out a pocket pistol and shot the Indian through the head, in which situation he was found. While the Stockbridges were engaged with the main force of enemy troops, the American light infantry were positioned to the north and west of Mile Square Road. As the fighting started and the British cavalry caught the Indians off guard from their rear flank, the American infantry took off. One account of the battle states that there were sixty light infantry and forty-eight Stockbridge Indians; the American forces were outnumbered nearly five to one. 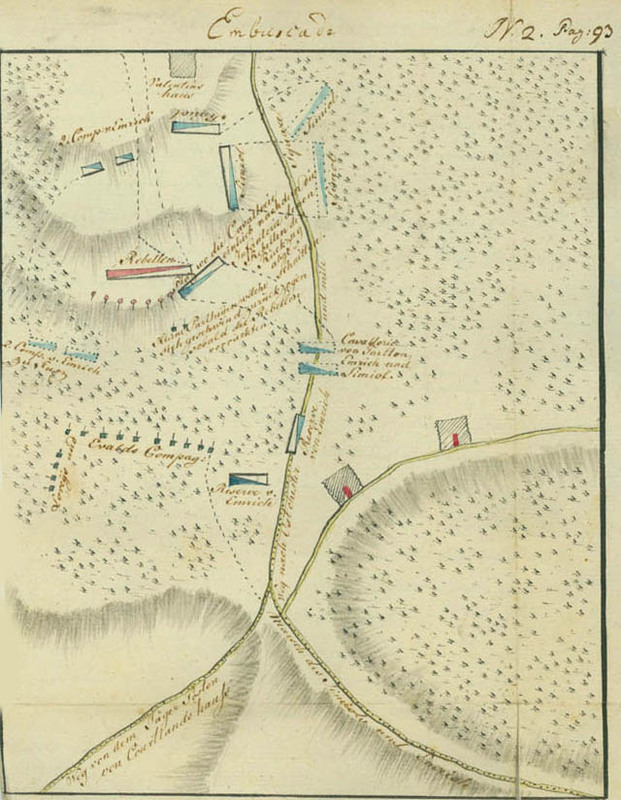 Simcoe's map of the battle clearly shows that the light infantry units were cut off from the main fighting along Mile Square Road and were obliged to retreat. During the action, just as Simcoe's men hit the left flank of the Indians, Daniel Nimham was the one to wound the British officer. With enemy troops at their front and rear, the old chief called out to his men to retreat, but shouted 'I am old, and can die here'" He was then shot by Simcoe's orderly. Nimham, sachem of the Wappingers and a leader of the Stockbridges, who had once visited the King of England in 1766 to try to stop the land frauds being committed upon his people, crawled off of the battlefield towards a stream where his body was later found. The Indians ran through the open fields bordering the road, where they were chased down by the cavalry and hit in the flank by infantry. Overwhelmed, the Indians refused to surrender, and few received quarter from the green-jacketed enemy. The Mohican warriors fought with a determination perhaps unmatched during the war; they leaped onto horses and dragged off the riders; tomahawks and knives had to suffice because there was no time to reload their muskets. Banastre Tarleton, who would later become the scourge of the southern theater of the war, would have been killed but for the lack of a bayonet on the musket of his Indian assailant. Captain Johann von Ewald, of the Hessian jagers attached to Simcoe’s force for the day, stated in his diary that the Indians fought with great ferocity and animation. Due to the wooded nature of the land, the Indians established several pockets of fierce resistance which were overcome only by the shear weight of numbers of the attackers. By seven in the evening, it was all over. Some of the Indians did escape over Tibbetts Brook and hid among the rocks and boulders. Unable to scale the rocks, the British horse soldiers called out for the fugitives to surrender, promising them their lives. According to one account, three Indians ventured out and gave themselves up, whereupon the British killed them. The site of this alleged atrocity is known as Indian Bridge, although its actual location is not certain. Magr Steward with a partie of about forty, and Capt Nimham with About the Same number parted at Volentines [Valentine’s] hill and appointed to meet at the forks of a road near the Enemy’s Picquet, but before or rather About their Meeting they saw a partie of horse In front. after exchanging a fuw Shot the Horse Gave way. the Indians pursued when they was led Into an ambusade serounded by a large body of Horse and foot, as was also the Majrs partie. there are not more than fourteen Indians yet com in. among the missing is Capt Nimham his father and the whole of the officers of that Corps, Majr Steward tells me that he Misses a Capt [a] Sub[altern] & About twenty men from his parties. I am in hopes that it is not so bad as it Presant appears But I cant promise myself that it will be much Short of it. As the dead and wounded lay on the battlefield, von Ewald surveyed the scene. Walking amongst the carnage, he took special note of the Indian warriors who had fought so bravely. Their costume was a shirt of coarse linen down to the knees, long trousers also of linen down to the feet, on which they wore shoes of deerskin, and the head was covered with a hat made of bast. Their weapons were a rifle or a musket, a quiver with some twenty arrows, and a short battle-axe which they know how to throw very skillfully. Through the nose and in the ears they wore rings, and on their heads only the hair of the crown remained standing in a circle the size of a dollar-piece, the remainder being shaved off bare. They pull out with pincers all the hairs of the beard, as well as those on all other parts of the body. As to the casualties of the battle, the British reported some thirty seven to forty Indians and a small number of other rebel soldiers killed or desperately wounded, and ten prisoners taken. Four British soldiers were reported killed, and three wounded, including Simcoe, although a Hessian officer reported as many as forty English dead. Although known as the Stockbridge Indian Massacre, and it was to be sure, most of the dead were other native warriors from New England, possibly from the Oneida as well. For the small community of Stockbridge, it was a catastrophe. Chief Nimham was dead, along with his son Abraham and thirteen other men. Of the approximately seventeen reported Stockbridge Indians killed during the war, at least fourteen of them fell in the Bronx. Ewald's version of the ambush differs from Simcoe in some minor ways. The role of Ewald and the Hessian jagers is shown at approximately where Simcoe shows Emmerick's men. This could be an error on Simcoe's part - Ewald shows these same two companies of Emmerick's men just to the west of the yager position. These two companies also move to the north in an effort to get behind the Indians. Another difference is that Ewald shows the Indians in a strong defensive position on the high ground, with skirmishers or small units in front. This depiction agrees with his description of the Indians fighting in pockets for a long period of time until they were all annihilated.